The magnetosphere refers to the region of magnetic influence of a celestial body. This varies depending on the size of the body and the magnetism it generates. Earth’s magnetosphere is defined by its internal magnetic field, solar wind plasma, and interplanetary magnetic field (IMF). When this mix of free ions and electrons, from both the solar wind and Earth's ionosphere become confined by magnetic and electric forces much stronger than gravity, a distinctly non-spherical shape is created. This bullet shaped effect radiates out approximately 36,000 miles. Not every astronomical object has a magnetosphere. Most planets in the solar system do, with the exception of a few. Icy moons are examples of bodies that lack a magnetosphere. The magnetosphere is created through electric currents flowing in space and is in a constant state of change, even flipping its orientation every few thousand years. 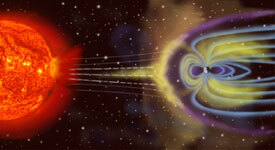 The magnetosphere serves an important function shielding us from some of the energy particles created by cosmic waves. The upper atmosphere intercepts energetic particles and circulates them throughout the magnetosphere. These trapped particles are responsible for natural phenomena such as the aurora and natural radio emissions. 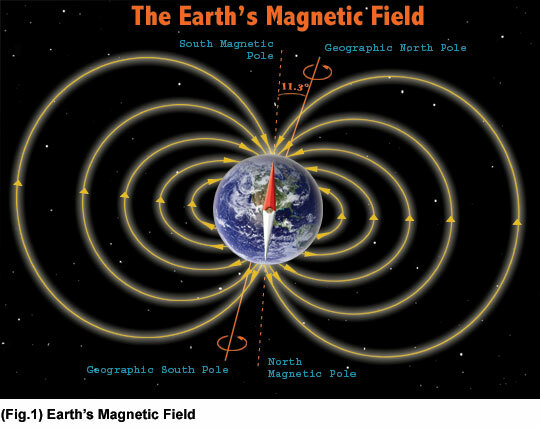 The Earth's magnetic field is approximately a magnetic dipole, with one pole near the north pole and the other near the geographic south pole. An imaginary line joining the magnetic poles would be inclined by approximately 11.3° from the planet's axis of rotation. It is often visualized in terms of magnetic field lines, or lines of force, that leave one end, the north pole, arc through space, and re-enter at the other end, the south pole. It is the motions of electrical charges in which magnetic fields are produced. The origin of the Earth's magnetic field is not completely understood, but is thought to be associated with electrical currents produced by the coupling of convective effects and rotation in the spinning liquid metallic outer core of iron and nickel. This mechanism is termed the dynamo effect. The Earth's magnetic field attributed to a dynamo effect is not constant in direction. Rock specimens of different age in similar locations have different directions of permanent magnetization. Evidence for 171 magnetic field reversals during the past 71 million years has been reported. A geomagnetic reversal or pole shift is a change in the orientation of Earth's magnetic field such that the positions of magnetic north and magnetic south become interchanged. These events, which typically last a few hundred to a few thousand years, often involve an extended decline in field strength followed by a rapid recovery after the new orientation has been established. The field is similar to that of a bar magnet, but this similarity is superficial. The magnetic field of a bar magnet, or any other type of permanent magnet, is created by the coordinated motions of electrons (negatively charged particles) within iron atoms. The Earth's core, however, is hotter than 1043 K, the Curie point temperature at which the orientations of electron orbits within iron become randomized. Such randomization tends to cause the substance to lose its magnetic field. Therefore the Earth's magnetic field is caused not by magnetized iron deposits, but mostly by electric currents in the liquid outer core. Another feature that distinguishes the Earth magnetically from a bar magnet is its magnetosphere. At large distances from the planet, this dominates the surface magnetic field. Electric currents induced in the ionosphere also generate magnetic fields. Such a field is always generated near where the atmosphere is closest to the Sun, causing daily alterations which can deflect surface magnetic fields by as much as one degree. Magnetometers detect minute deviations in the Earth's magnetic field caused by iron artifacts, kilns, some types of stone structures, and even ditches and middens in geophysical survey. Using the magnetic instruments adapted from airborne devices developed during World War II to detect submarines, the magnetic variations across the ocean floor have been mapped. The basalt - the iron-rich, volcanic rock making up the ocean floor - contains a strongly magnetic mineral (magnetite) and can locally distort compass readings. The distortion was recognized by Icelandic mariners as early as the late 18th century. More important, because the presence of magnetite gives the basalt measurable magnetic properties, these magnetic variations have provided another means to study the deep ocean floor. When newly formed rock cools, such magnetic materials record the Earth's magnetic field. In October 2003, the Earth's magnetosphere was hit by a solar flare causing a brief but intense geomagnetic storm, provoking unusual displays of aurorae. The earth's magnetic field strength was measured by Carl Friedrich Gauss in 1835 and has been repeatedly measured since then, showing an exponential decay with a half-life of about 1400 years. This could also be stated as a relative decay of about 10% to 15% over the last 150 years. 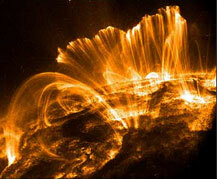 Some free-energy enthusiasts claim that the Earth's magnetic field could be used to generate power. Many designs for using the Earth's electromagnetic field and atmospheric electricity have been researched, but have failed to gain any widespread acknowledgment in the scientific community. There is also some energy stored in the form of separated electrical charges, which can provide low direct currents at high voltages. However, ordinary electric motors cannot use this energy directly as a prime mover. Benjamin Franklin developed several motors that used the Earth's fields. Oleg D. Jefimenko has researched several machine designs for tapping the Earth's electromagnetic field. The Earth's magnetic field can be used as the starting field for a self-excited electric generator. Cromwell Varley discovered in 1867 that an electric generator did not need to be started with a conventional prime mover. He used the Earth's magnetic field to induce enough field strength in the stator windings to get a generator running. Electrodynamic tethers can induce a current by moving through the planet's magnetic field. When the conductive tether is trailed in a planetary or solar magnetosphere (magnetic field), the tether cuts the field, generates a current, and thereby slows the spacecraft into a lower orbit. The tether's end can be left bare, and this is sufficient to make contact with the ionosphere and allow a current to flow through a phantom loop. A cathode tube may also be placed at the end of the tether. The cathode tube will interact with the planet's magnetic field in the vacuum of space. A double-ended cathode tube tether will allow alternating currents.